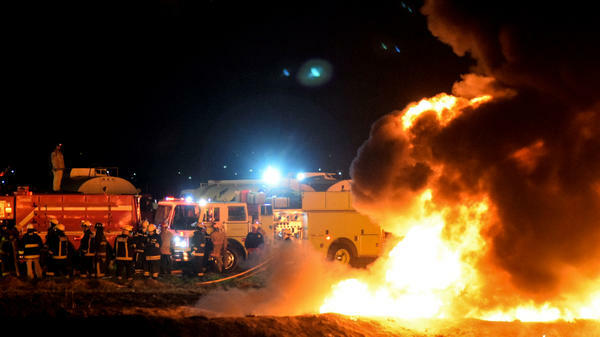 Firefighters work to extinguish a massive blaze triggered by a leaking pipeline in Tlahuelilpan, Mexico on Friday night. Mexico's health minister said at least 89 people were killed. For weeks, a crackdown on fuel theft by the Mexican government has led to widespread gas shortages and miles-long lines at gas stations. So when a pipeline in the state of Hidalgo burst open Friday, sending a spray of fuel into the air, area residents rushed to collect it in buckets and barrels. Two hours later, the gushing pipeline exploded, turning what had been an excited gathering into a hellish inferno. Mexican Health Minister Jorge Alcocer said Monday morning that the number of dead in the incident had risen to 89 people. An additional 51 people were injured. Photos of the aftermath show a field littered with charred bodies, as authorities investigate the scorched field in the city of Tlahuelilpan, north of Mexico City. The leak was reportedly caused by an illicit pipeline tap. Last year, pipelines were illegally cracked into about 42 times a day in Mexico, according to The Associated Press. Those taps, along with theft by corrupt officials, accounted for more than $3 billion of fuel stolen from the state-run oil giant Pemex in 2018, according to President Andrés Manuel López Obrador. López Obrador, who took office in December promising to fight fuel theft, said he was mobilizing his entire government to help those at the site of the disaster, and vowed to double down in his mission to cut back on the illegal siphoning of fuel. "We will carry on until we eradicate this practice," he said, according to The New York Times. The Mexican government's official Twitter account doubled down on the effort Sunday, writing: "Nothing is more valuable than your safety and your life. Avoid the purchase of illegal fuel and report any anomaly in your community." Video from before the explosion showed soldiers standing by as buoyant locals gathered around the leak. The country's public security minister reportedly said the troops had arrived at the scene to secure the pipeline, but withdrew because of the size of the crowd. As NPR's Carrie Kahn has reported, López Obrador has been using the military to try and get a handle on the rampant illegal tapping of state-run pipelines. "The government said it dispatched 5,000 members of the armed services and federal police to guard points along the pipelines and Pemex distribution sites to cut down on the theft. Armed escorts now accompany truck drivers on their routes." "Last month, López Obrador shut down six pipelines to thwart the thieves and began trucking gas to stations, a much securer but slower and costly alternative. Within a week, fuel shortages led to shuttered stations and long lines around the country." In recent years, fuel theft has grown from a common, but de-centralized problem to a massive operation, organized in part by Mexican cartels. A federal police officer told Kahn that government employees are often involved in the racket: Last year, the town of Tlanalapa's ambulance was confiscated after it was caught transporting dozens of plastic containers full of black-market gas. But in a country with low salaries, Kahn reports that there's both an incentive for Mexicans to get into the fuel theft business, and a market for cheaper, stolen fuel.